It's July! Can you believe it? Happy July to you! This week, I'm still plugging away on my ripple throw. I didn't work on it much while we were away on vacation last week, but I've been making up for lost time since we've been home. I have finished about half of the dark green section. I only crochet a little at a time, since it's a bit hot to have an afghan on my lap right now, but I'm still enjoying it. The pattern is soothing. I'm thinking about using it with worsted-weight yarn this fall when I start my yearly cold-weather crochet project. It will be another big blanket for my family room. Just one more to make and I'll have a complete set of four fresh, new ones. Thanks for offering your input on making blanket after blanket. I'm glad I'm not the only one who feels compelled, and happy, to fill her house with afghans. As for reading, I haven't started a new book after finishing the ones I took on vacation with me. I've been reading the July issues of my magazines instead. The pile was getting a little ridiculous on my desk and it was time to tackle it. 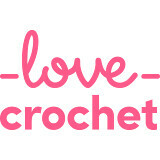 I have three subscriptions currently: Sunset, Martha Stewart Living and Interweave Crochet. I've always loved magazines, from my first subscription to Highlights. Did you read teen magazines? I was a Sassy girl myself (the first issue I bought had Kurt Cobain and Courtney Love on the cover), but I liked YM and Seventeen too. Do you have magazine rituals? I do. I prefer to read them at the kitchen table in good light with a cup of tea. During the school year, I do this on a weekday morning when I'm at home alone. In summer, the ritual goes out the window like so many others do. Now, I'm happy to read a page or two in between whatever I'm doing with the kids during the day. It's all good; the ritual will resume before I know it. totally can relate to the ridiculous summer blanket knitting....just ready to start another as soon as i find the perfect yarn (it's a baby blanket, so maybe not quite as ridiculous and many summer ones i've made!!!!) :) happy hooking! Happy summer to you !!! And happy hooking !not ridiculous at all to work on blanket in summer ...we're preparing the rest of the year with cozy stuff .... enjoy your hooky time ! the blanket is looking good. I am a magazine junkie!! I love magazines too, particularly Country Living. I tend to buy the autumn and winter ones then read them curled up somewhere. It's been incredibly hot here today - too hot even to go out and do something. So we stayed home and pottered about and dried inordinate amounts of washing on the line. I am a great fan of magazines, my daughters buy me subscriptions for gifts, we call them the gift that keeps on giving. I always sit down and make a pot of tea to have with it. The blanket is coming along nicely. I love magazines too--home interiors, crafts, living. At the moment my favourite is 'the simple things' . My mother-in-law lends me her copy of 'homes and antiques' every month and I enjoy that too. I also like to read them with a cup of tea, usually on the dining table. Enjoy working on your blanket and happy summer to you too! I don't read magazines nowadays but occasionally my daughter buys a very stylish beautifully photographed publication that is so rarified it doesn't even carry advertising and I glance through it. When I was a teenager in the 1970s I used to have Honey magazine delivered. My favourite part was always the fashion pages especially when shot on location. Years ago I used to buy the odd high-end gardening magazine and I used to cut out all the pages that appealed. That really helped when laying out my blank canvas garden here. (Our house was a new-build in 1991 and we started with nothing except a very dodgy fence.) It's too hot to handle anything woolly here in the UK so my dream of knitting while watching Wimbledon has had to be abandoned, but I'm enjoying following the progress of your ripple blanket. Happy July to you as well, Jennifer! I have knit three blankets only one of which I kept and still use and it is nearly an antique, almost 50 years old! I started a crocheted blanket long ago but did not like the colors I chose or the ripple pattern, so I never finished it. Now I still have a merino blanket that I really need to knit on a regular basis so that I can finish and use it. You inspire me to do so! I love magazines. I think the short articles are perfect for people who are busy as they can be read so quickly, unlike books. They're so convenient to pick up when you get a spare ten minutes. Saying that, they're so expensive these days, it's cheaper to buy a book in some cases, so I've stopped buying them unless I see something which especially pulls me in. 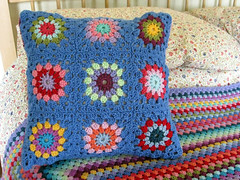 I don't think you can ever have too many blankets, they're such lovely things to make as well as being wonderful to use. I love reading special interest magazines, trouble is, then I want to keep them all, and they start to fill my house! So many lovely patterns and recipes I want to keep. I love my country living magazines I have about 100 or so. And when I was younger I liked just seventeen too !! 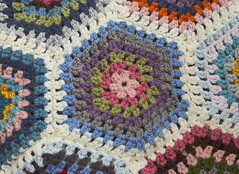 I've never done a ripple but have many large grannies started and yet to be finished. My magazine buying happens during the summer while in the States. Can't find many decent ones here so I don't even bother; especially since they are sometimes censored. I also usually do my book reading during the summer as there just seems to be more time for it when traveling. Happy July! Lovely ripple...it is coming along really well. I love magazines too, and always have, I just can't resist them! The blanket is fabulous and I love magazines too, especially crafty ones.